This page describes the various library maps available to help you start your own 2020 presidential election forecast map. The default is the actual map (ignoring faithless electors) from the 2016 presidential election. Make your Starting View selection via the drop down menu at the bottom of the interactive map on the home page. If that isn't visible, select the Reset Map option. Alternately, you can select one of the maps below and you'll be taken to a stand-alone version of that map which you can share via social media (before making changes) or edit to create a 2020 forecast. 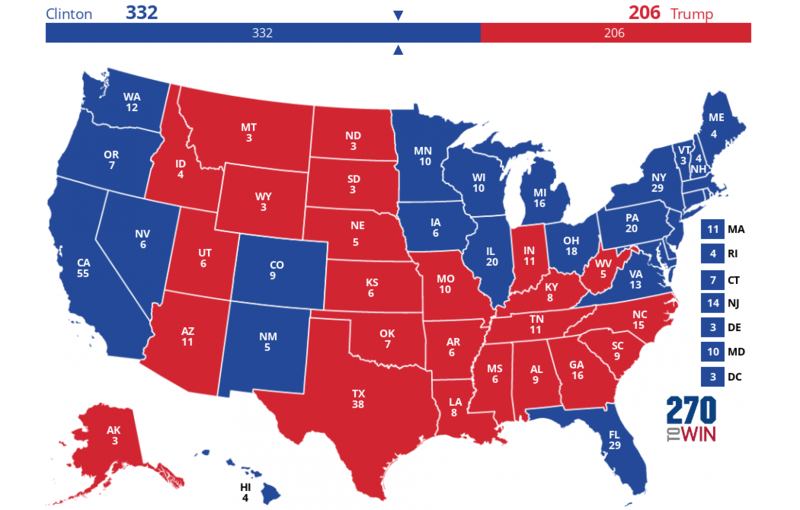 Other starting views for 2020, such as the battleground map, polling map and consensus pundit map will be added as we get closer to 2020.